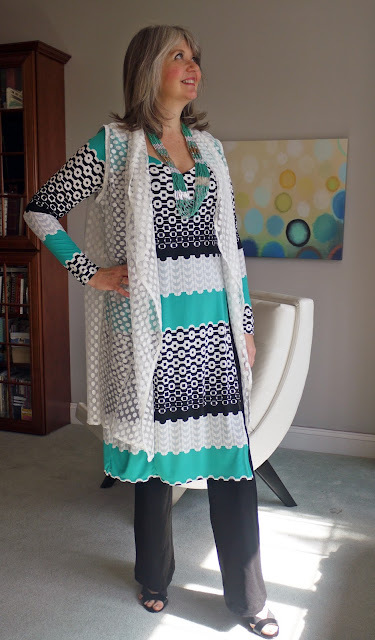 I absolutely love the big, bold and bright ITY knit prints that have been coming out lately on the Fabric Mart website. They are perfect for dresses, but what if your lifestyle doesn't need a ton of dresses? I think I've found the answer: long tunics! For these outfits, I used Vogue 9159. This pattern includes both a shorter and longer length tunic, and the slightly flared pants. The tunics have an inset at the sides of the front, and one of the seams isn't sewn all of the way, creating a nice deep walking slit. I always have to test out a pattern from an inexpensive fabric to make sure I like the fit, so my first version was with an ITY knit that I got from the $1.99 section at Fabric Mart. I loved the colors and wanted to show off as much as the extra large paisley print as possible, so I made the longer version. What I learned from making the test version was that the neckline was pretty wide, and that even though I staystitched the neck facing, that the facing was going to roll out- just the nature of the beast. 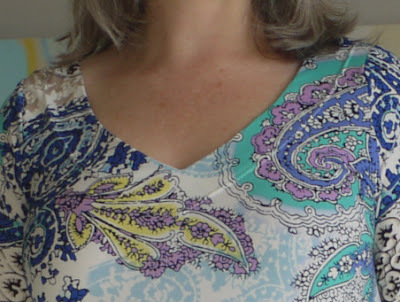 To remedy this, I used a double needle and topstitched 2" from the neckline edge as you can see in this close-up. I like the extra stitching detail, and used it on the other versions as well. So, for my second version, I wanted to try the shorter length tunic and I brought in the neckline about 1/2" all the way round. 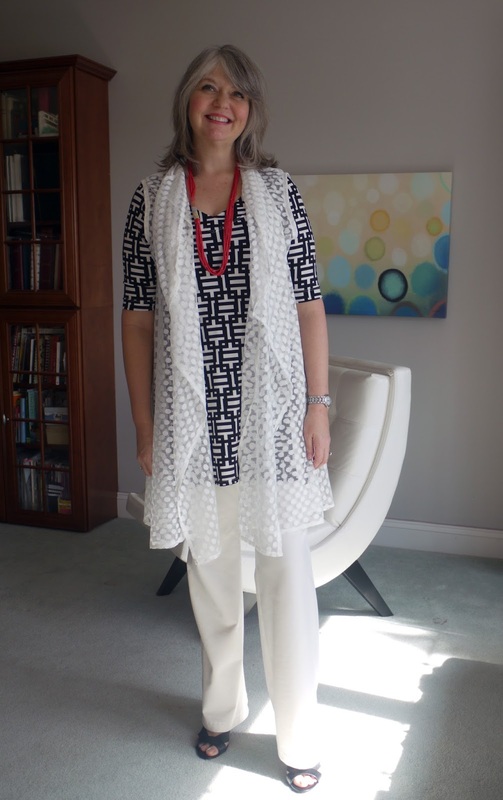 I used a black and white graphic ITY knit and some ivory ponte knit for the pants. The pants are really comfortable, by the way. Even though they aren't the focal point of the pattern, I think they are a gem of a pattern. The cut is just right to taper in at the knee and flare out just enough to give a nice curve. I saved my favorite fabric for last- this teal, black and white graphic stripe. I decided that I really liked the longer version on me, so I made this version longer as well. 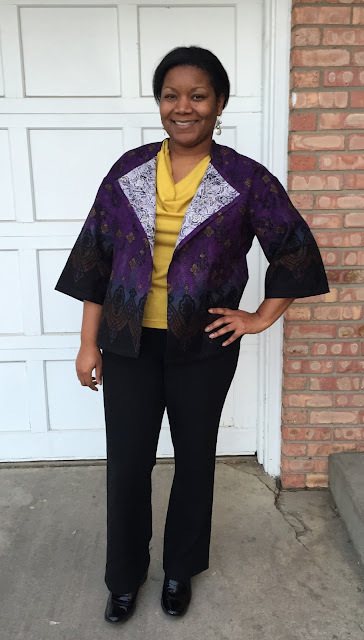 I used a black ponte knit for the pants, and an ombre silk chiffon for the scarf. There is a center back seam in this pattern which allows you to have some shaping at the waist. I had to be careful when I cut that the stripes would all match on the sides, sleeves and center back. I also intentionally put a black area at the waist to give an illusion of a smaller waist. I know that many fashion gurus tell you not to wear horizontal stripes, but I think if you place them strategically, that they are just fine! When I ordered these two knits, I had also ordered this white lace with circles, planning on making a scarf with it. However, when I got it, the lace had far too much body for a scarf, so I had to come up with a plan B. I made this waterfall vest instead! 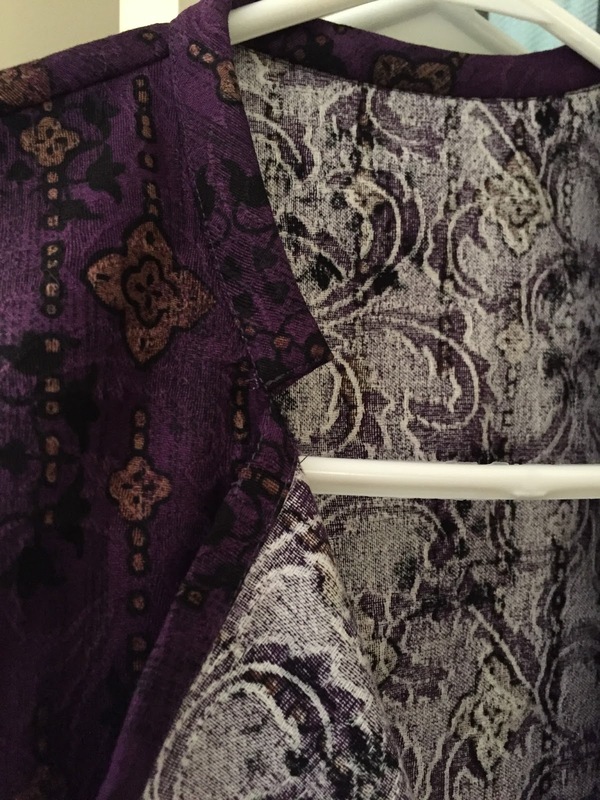 It's definitely a lot of pattern combined with these prints, so I"m not totally sure that I'll wear them together. Although I'm sure that I could wear it with a solid tunic. I'd be interested in your opinions: yay or nay on this lace vest with these tunics??? But with or without the vest, I'm in love with my new tunics. With just five pattern pieces, they were super quick to sew! I think I may have found my new "uniform" for Spring. I feel "dressed" without feeling too dressy, which can be a tricky balance to achieve. Thanks for reading, and I hope that you have an extra special Leap Day! Browsing the site (as I do most days! ), I came across THIS beautiful Maggy London cotton jacquard with an interesting border and just had to have it. Initially I was thinking drawstring-waisted casual pants, but Julie let me know that the hand was a bit stiffer and better suited to a more structured garment. Look at that texture and vibrant color! I decided to go with a simple, boxy jacket and let the fabric do the talkin'. 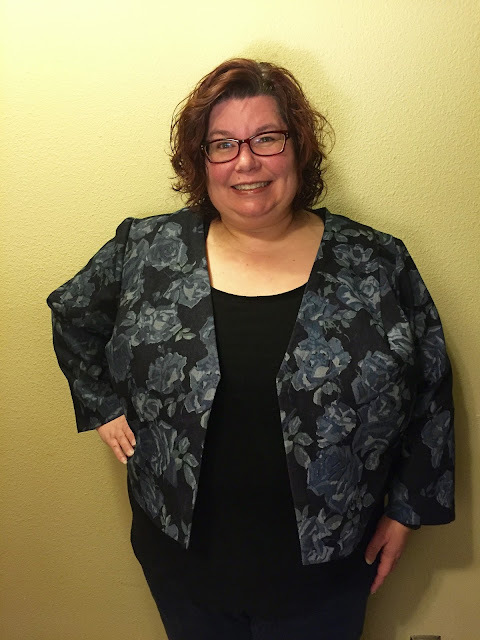 I went with this unlined jacket from the 2/2015 issue of Burda magazine. It is a very simple jacket as it doesn't even have facings. They recommend fabric with 2 good sides (be it the same or contrasting) for this reason. Next, I have absolutely no idea how I was supposed to sew the collar. I tried a few different times and decided I didn't like it as much with both lapels and collar showing the wrong side so I went with a bias tape finish. I cut my fabric on the bias to account for seam allowances and a 1/2" finished width. I sewed it as one would exposed bias tape - meaning I sewed the tape to the WRONG side of the fabric and then pressed the other folded edge in place over the stitching. I then topstitched the bias tape from the right side. I like it! Front was turned in 1/4" and then another 1/2" and topstitched. 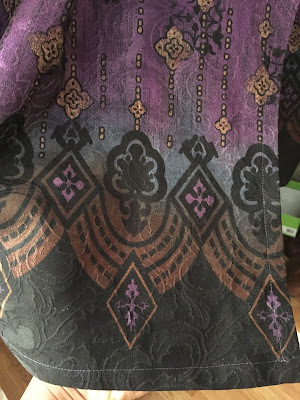 This fabric takes a press so nicely!! I used a press cloth when pressing the black part so I wouldn't cause a shine. As it's still very much winter in the tundra, I had to settle for so-so photos. No one in my family liked the finished jacket -- good thing they don't have to wear it! :) I love, love, love the fabric and it really stands out. Have you ever wanted to sew a jacket for yourself but were dreading all of the tailoring, dealing with a lapel/collar, and closures? 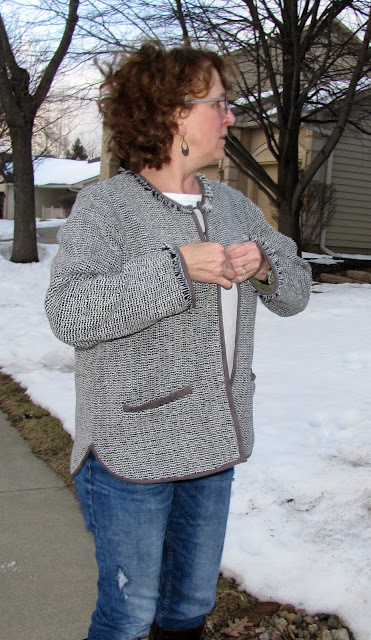 What if there was a jacket pattern that was as easy to sew as a cardigan and in such a basic, versatile style that it could be worn with nearly everything? 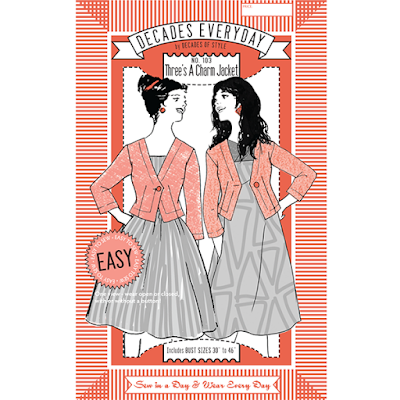 Enter the newly-released Three's a Charm Jacket, from Decades of Style, as part of their Decades Everyday line. The pattern company Decades of Style has been around for quite a while, producing vintage reproduction patterns from the 20's, 30's, 40's, and 50's in a wide size range for home sewists. While I've liked a number of their designs over the years, I never seriously thought about sewing any of them because I was afraid that it would look like I was wearing a costume, given my casual personal style. However, last year, DoS launched a new pattern line, Decades Everyday, which incorporates vintage details into everyday-wearable styles. 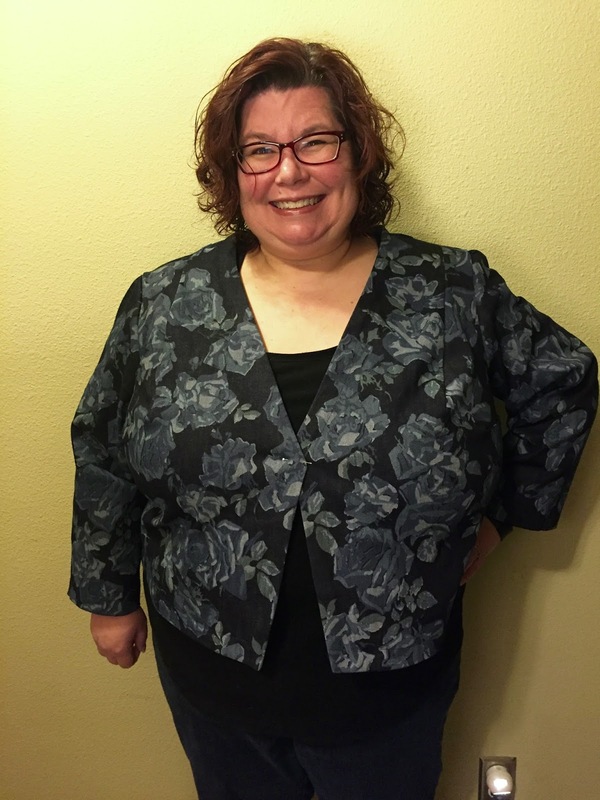 The two patterns that they released last year have been very well-reviewed, so as soon as they started posting teasers on Instagram for this new jacket pattern, I knew that I wanted to buy it, and I knew that I wanted to use it for my Fabricista project for February. I apologize in advance for the poor lighting in these photos. We were waiting for a sunny day here in the Pacific Northwest, which didn't arrive by the time that this post was scheduled to run. Note that I have the jacket closed with a pin in this picture. You have the option to use a button or hook and eye closure for this pattern. None of the buttons in my stash called to me for this particular project, but on the other hand, I'm not quite ready to settle for a hook and eye yet. So...being closed with a pin (and otherwise worn open) will have to do for now. 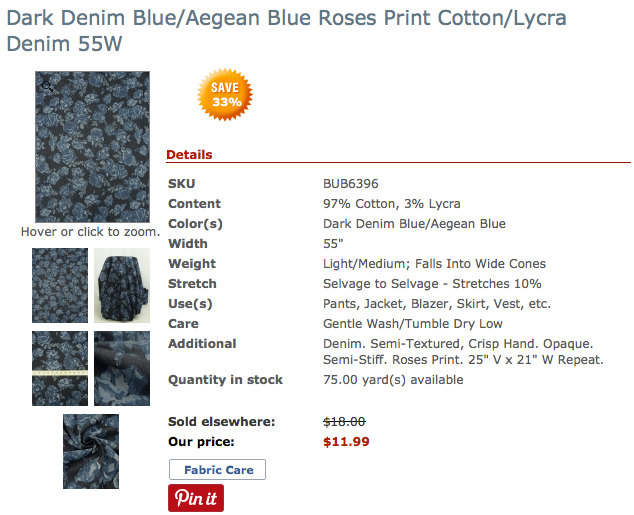 This denim fabric is 97% cotton and 3% lycra. If you order, make sure to pre-wash, as it does soften up quite a bit in the wash. The scale of the print works well for a jacket, skirt, or a pair of floral-print jeans, which have been back in style again for the past couple of years. If you wanted to get fancy with finishing your seam allowances, you could do a Hong Kong finish on the insides. Since I was working with denim, I opted to simply serge my seam allowances. 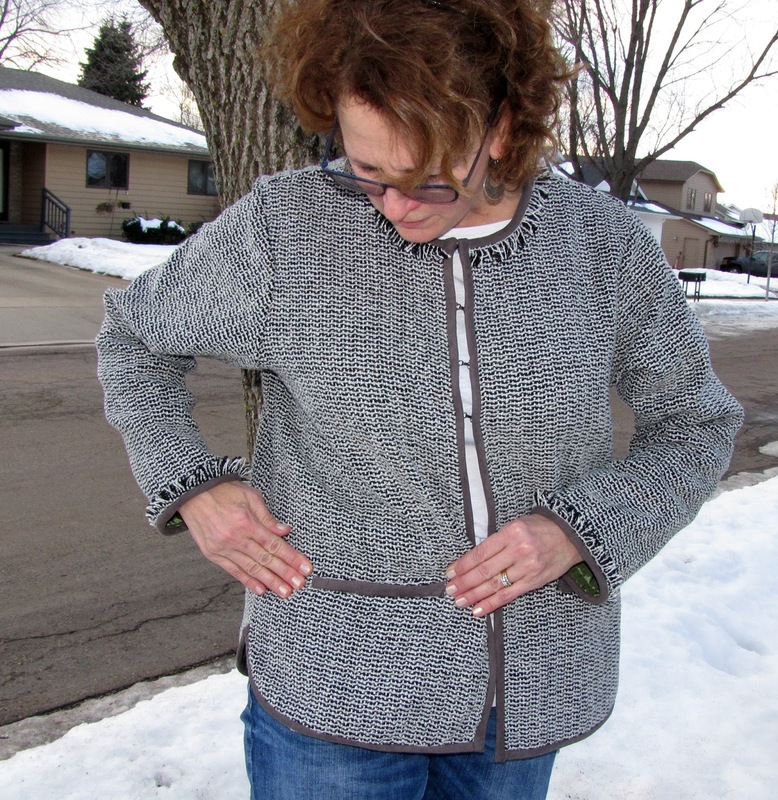 For such a simple jacket, a surprising amount of shaping was drafted into this pattern. It includes back shoulder darts, back waist (fisheye) darts, bust darts and front waist (fisheye) darts. I added a shoulder dart as part of the Full Bust Adjustment (FBA) that I did, which required me to rotate part of the bust dart elsewhere so as to not make that dart too large. Overall, I think that this is a great little jacket. I'll get a lot of use out of this particular version as a transition piece going into spring, and I definitely expect to use this pattern again in the future. I have been busy working on my 1st speed tailored jacket. This might have been the most enjoyable sewing project I have ever worked on. I used a traditional fabric, which is a classic tweed/boucle blend, and decided to speed tailor it using fusibles. Learning tailoring has been so rewarding. I will include some learning resources that helped me tailor the perfect jacket and set in the perfect sleeve! I just LOVE working with natural fabrics. This one is a 100% wool tweed boucle from Fabric Mart... and would you believe that I scored this at an amazing price of $17 a yard? I styled this jacket with a chunky statement necklace and this gorgeous clutch. And for a more casual look, I would pair this jacket with a silk scarf and riding boots! Here is the back view. It really is a gorgeous fabric! I love the orange speckles in it! Between this and the last Wool Coat I made, I have learned so much about tailoring coats and jacket. The one thing I love about sewing is that you never stop learning. I used the following two classes to learn the art of tailoring and I recommend them to anyone who wants to make jackets or coats. I copied the pattern from a ready-to-wear garment. You can see an example of how it's done on this video I created. 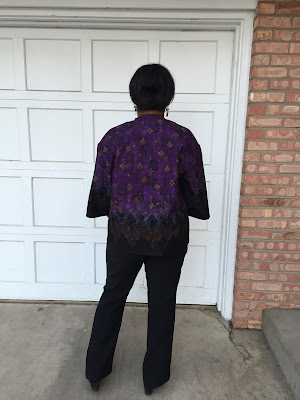 I hope you enjoyed reading this post and you are enjoying your sewing and styling as well! Fit-Along Episode 1 is Live! Episode 1 of the Fit-Along is now live! I'm a few days late in posting this (sorry!) We've had a really great response to the first epsiode and I'm so glad there are many of you going to fit and sew along with us. In this episode, Melissa and Julie will go over the history of Palmer/Pletsch Tissue Fitting Method, the supplies you will need and how to measure and choose the right size for your body. 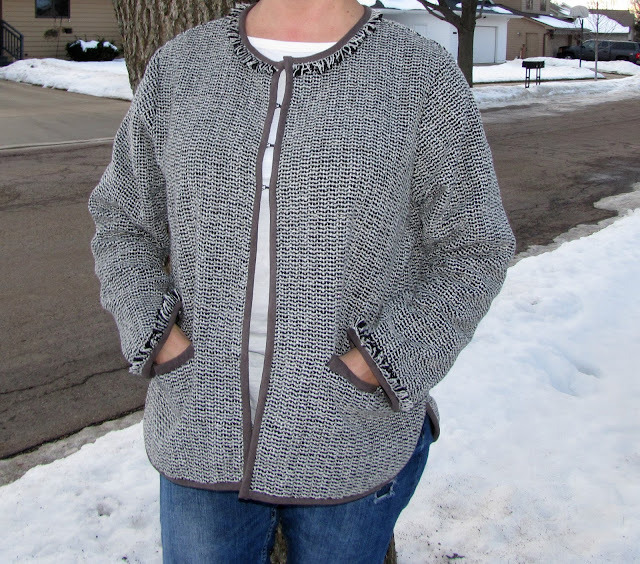 Julie will give a rundown of knit fabrics including the best types of knit for this design. Melissa will show you how to prepare your pattern for successful tissue fitting. 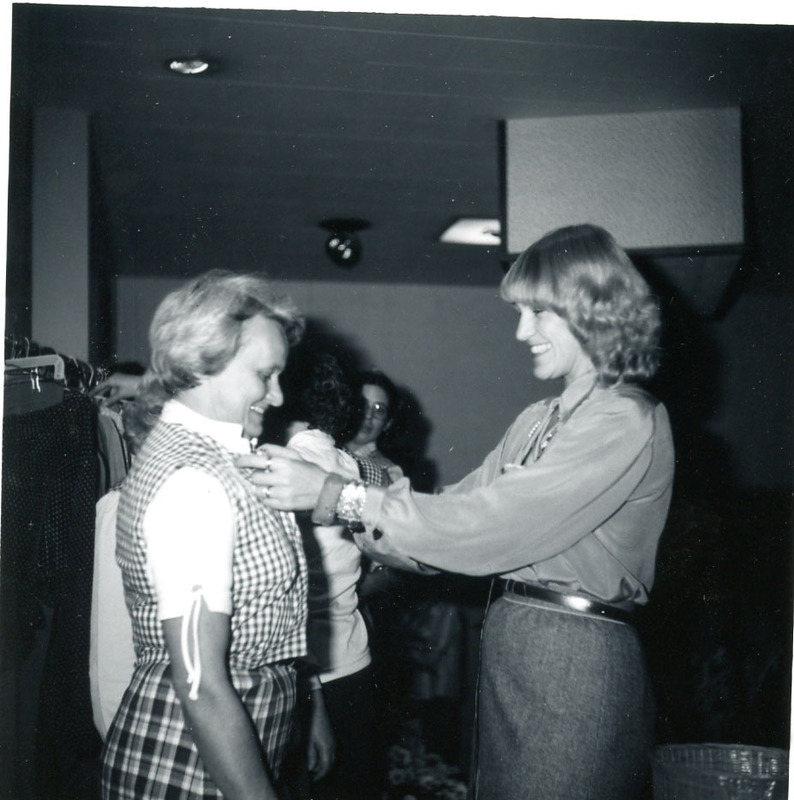 You will even see some old pictures of Pati tissue fitting in the 70s! The great thing about the videos is that they will be available forever! You can fit and sew along with us anytime, whether you do it now or not. And to make your experience even better, we're offering fabric kits. 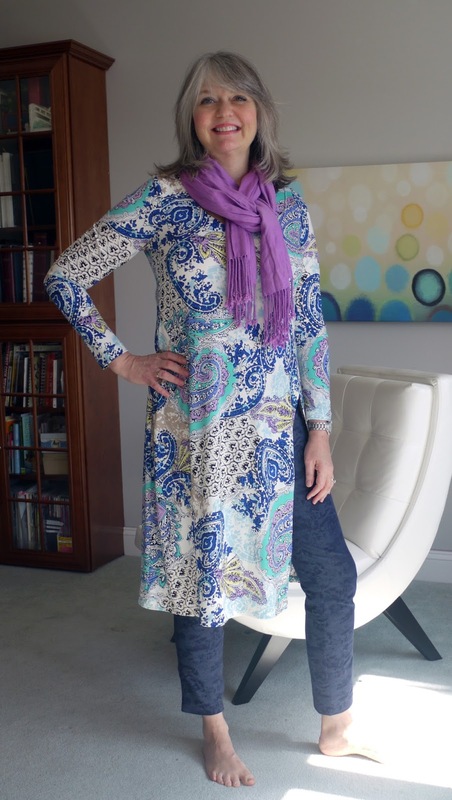 I have hand-picked a selection of knits and rayon challis that are perfect for this wrap dress pattern. The kits include enough fabric to make the long dress with the long sleeves in the largest size, thread to match and the pattern. You also get a pre-printed copy of the Palmer/Pletsch body map and fitting order which you can print for free HERE. The fabric kits have been live for a few days and as I type this they are actually kind of picked out! Since we didn't know how well they would go, we put together a select number. But now that we had a positive response, more patterns are on order and the kits are being cut. Watch for an update here, Facebook and through our website email list. We'll let you know when they are ready to go! We'd love to hear from you! If you have any questions along the way, don't hesitate to post a comment or email me at fabricmartblog@gmail.com. 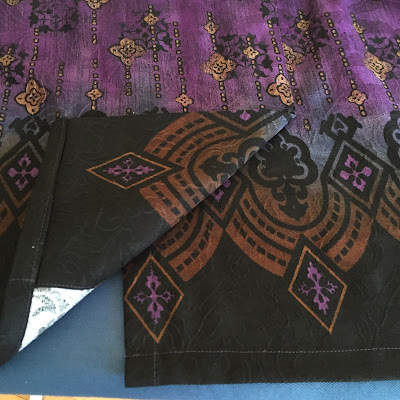 Made by a Fabricista: A Fringed Tamarack by Grainline! 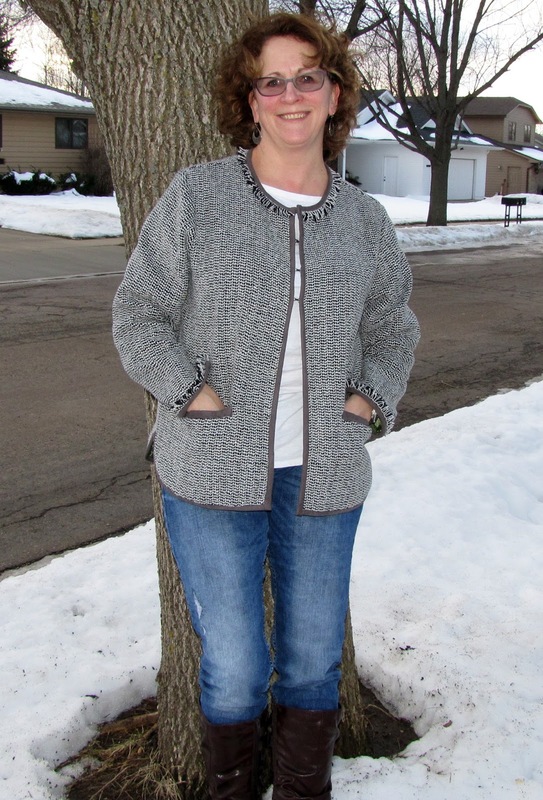 Maybe you've figured this out, but I really love sewing with wool, and I love making jackets. 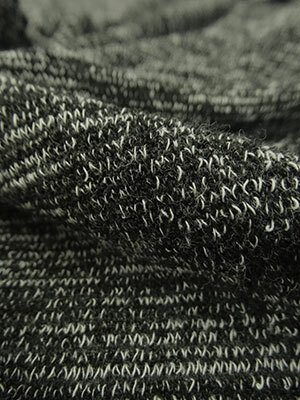 So for this month's contribution to Fabric Mart, I choose this lovely wool that has a slight hint of some sparkle in it. I wish I could have captured it with my camera! Trust me, the sparkle is there. I knew I wanted to make a jacket with the lining quilted to the wool and when I came across this newish pattern from Grainline, called the Tamarack, I knew it was exactly what I was looking for! The style is classic, there isn't a lot of fitting, and it looks like the jacket would look great on a variety of figures. 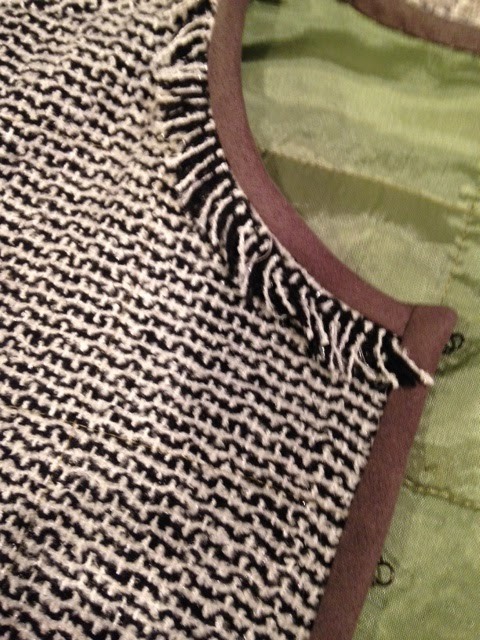 I eliminated using the batting between the lining and the wool. Had I used a cotton or a similar lightweight fabric then I would have used the extra layer of warmth. I also thought it would be fun to use this 'suede' to trim the jacket. I love mixing wool with other fabrics that you might not expect. Construction of this jacket is easy-peasy and it gives you some room to play with your fabric. I decided at the last minute to add the fringed trim to the cuffs and the neckline to give the jacket a unique look. To make your own fringe from wool fabric, cut strips of your fabric either on the lengthwise or crosswise grains, about twice the width of what you'd like it to finish as. 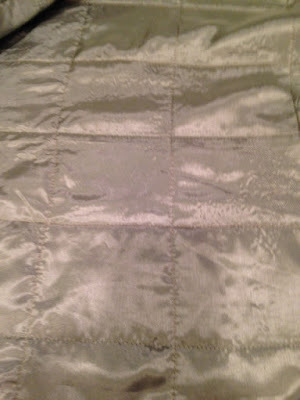 On one side of the width of the fabric, stitch, sort of like staystitching. This wool was pretty ravely so I decided to serge the side that would be enclosed in the trim. 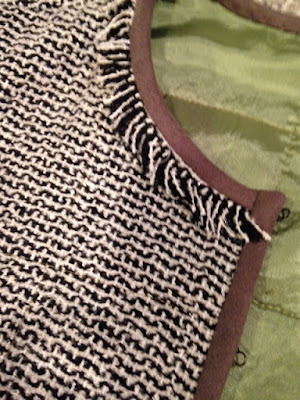 Fray the side not staystitched and trim as necessary to give you the finished width you prefer. Baste the trim to the jacket and apply the finish. In this case, my finish was bias cut pieces of the 'suede' that I cut in 2.5 inch strips. I applied the trim to the jackets right side, folded the edge to the inside and then stitched the trim by hand to the lining. Do you have fun with lining colors? I thought about black or gray but decided on this spring green color which is much more evident in the photo above this one. I am so ready for spring temps to arrive and this brightened my mood as I stitched the wool to the lining in a grid pattern. This wool behaved beautifully! See how nice the sleeve hangs along with how well the sleeve was set into the garment? One thing to remember when you are working with a wool that has a novelty thread running through it is to use a press cloth so the fibers don't melt. It is a good idea to test iron a scrap of your fabric so you don't make any big mistakes on your garment! I love how the shoulders are slightly dropped and the easy fit of the back. The shaped hemlines are also pretty cool and lend a nice component to this jacket. 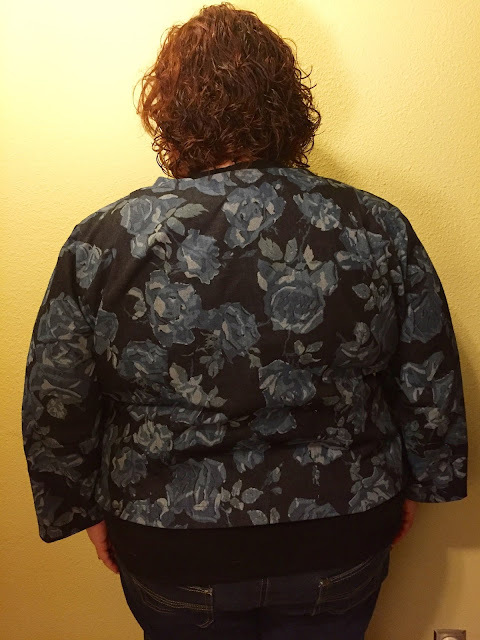 I did make my standard alterations to this jacket: 1/2" swayback adjustment, 1/2" FBA, and 1/4" sloping shoulder adjustment. I am 5'7" and the jacket length and sleeve length are perfect. Those welt pockets are nice and deep and in a great position on the garment. I really like them trimmed with the suede. I needed these nice deep pockets today! It is cold outside! This jacket has hook and eye closures and I just laid them out how I wanted them spaced on the front. I like my new jacket! It is warm and comfortable and I love the fabrics I choose! With a great deal of international and domestic traveling around the corner (and also back to back), I have been working on some functional, yet stylish travel gear. Yes, I am the lady in the airport with heels on! I have an extreme love/hate relationship with track pants. As an avid gym rat, I stay clear of garments that have any type of elastic waist or draw strings. Something about the way it feels against my skin creeps me out. 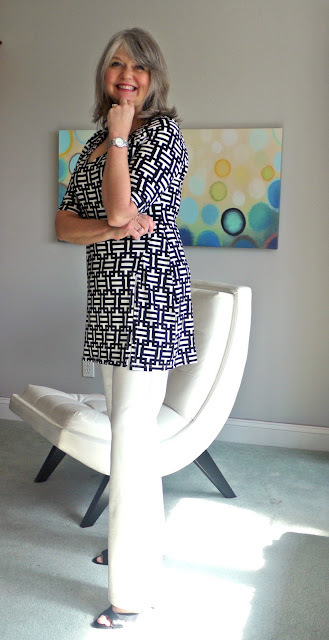 The fabric I selected for this post is a Maggy London rayon/poly/lycra sweater knit found (HERE). 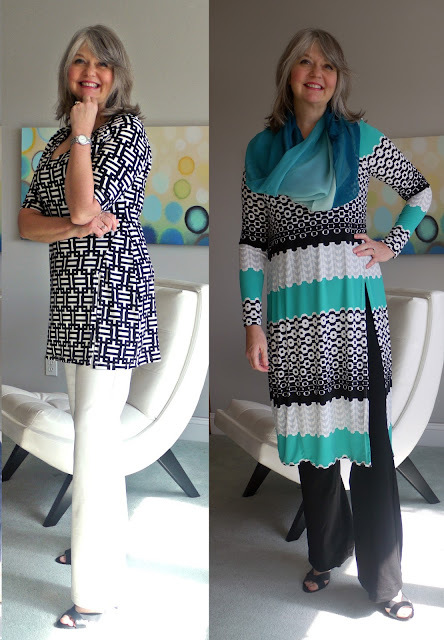 I also used black and white Ponte knits found (HERE) & (HERE). I have been wearing a ton of black, white, and gray tones lately, so this was right up my alley. 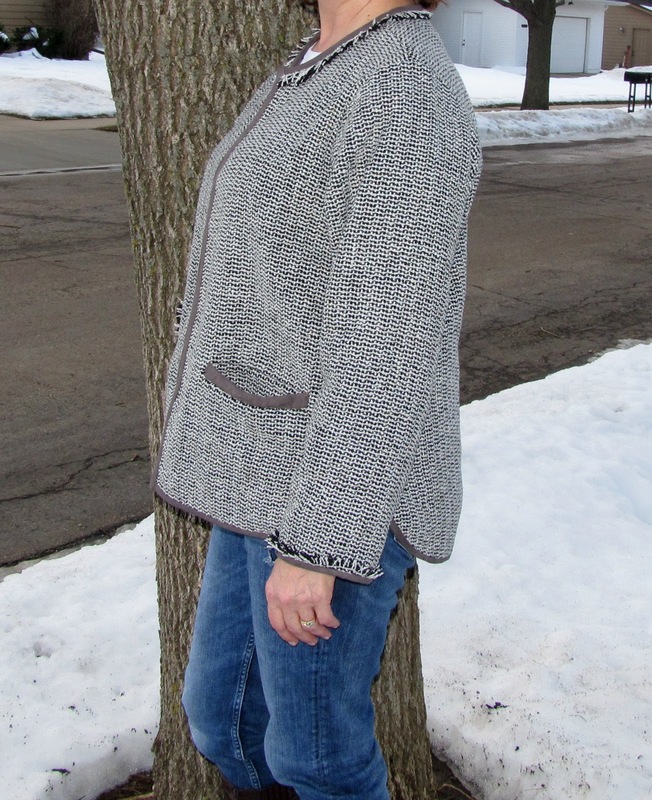 I used McCalls pattern 7199 for the jacket (view A). I cut 2 inches off on the bottom as it was a bit long for my taste. 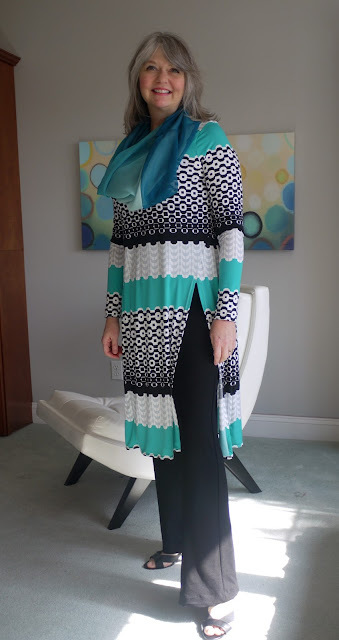 I used the black ponte knit as a contrast for the upper side front, and the upper side back pieces of the pattern, as well as the sleeve cuffs. I drafted the cuffs which are really simple to do. If you need an idea of how to draft your own cuffs, there are a TON of YouTube videos and blog posts that can help to point you in the right direction. For the pants, I used Vogue 8909. 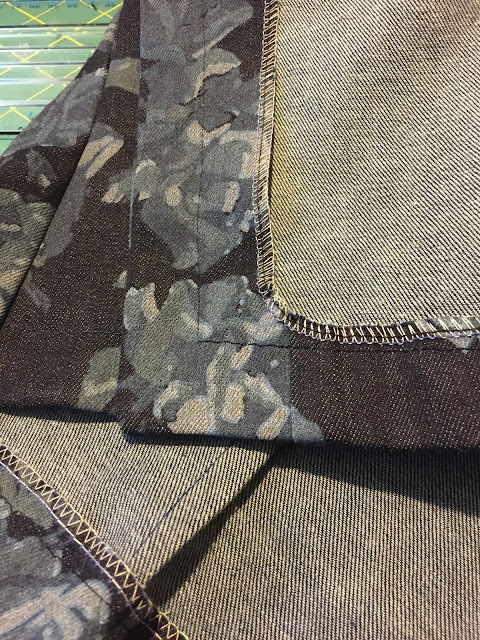 I drafted my pant cuff and waistband to keep it consistent with the jacket. For the top, I used the white ponte knit to create McCall's 7127. In all I really love this outfit. 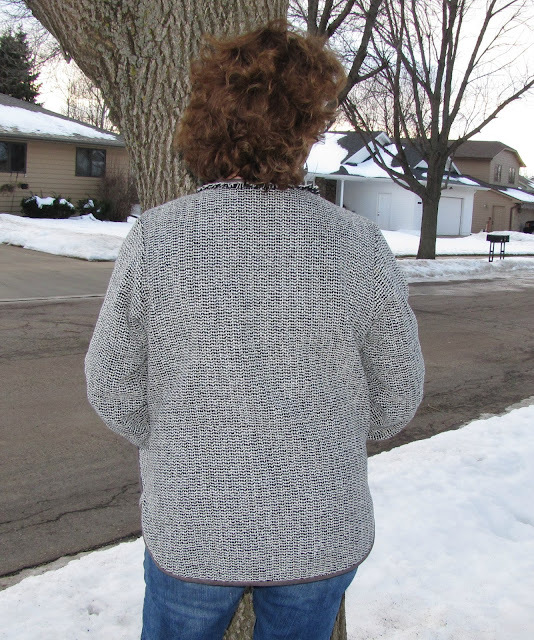 The sweater knit is light weight, I can layer it in different ways depending on the weather, and the each piece can be worn separately to create other outfits. This will definitely work for my day trips in London and even for long walks in Rotterdam next week.